Thinking of knitted things probably brings back memories of the itchy jumpers your nan lovingly knitted for you as a youngster. Luckily, knitted ties don't actually touch your skin when wearing them, so no need to worry about any itching. They're a unique alternative to classic ties that adds a casual yet stylish touch to any outfit. A knitted tie isnât for everyone. Ties are usually worn to formal or semi-formal occasions, but can also be used to add an edge to a more casual outfit. Knitted ties are the perfect compromise between classic and casual attire. Therefore, they're great for events that don't have a very strict dress code. Everyone agrees that a knitted tie is a more casual accessory. However, some believe they shouldnât ever be worn with a formal suit. We disagree because we love how they break up the smooth and shiny look of suits. Enjoy wearing a denim shirt but get frustrated by the stereotype they carry? A knitted tie works well with denim! Whip one on, and youâll suddenly feel presentable in front of your friends and loved ones. 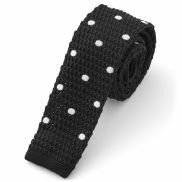 As they tend to be a casual tie, they lack a certain crispness compared to a twill or woven tie. Knitted ties can shrink, stretch out, and can be clingy, making them look shabby quicker than other ties if you arenât mindful when tying one on. Knitted ties arenât going to be a popular choice for formal events but they do possess the ability to dress down suits to a more casual affair. In short, they look great in more relaxed environments. Knitted ties are seasonal when it comes to colour use. The usual assumption is that knit ties are for winter only. That isnât necessarily true. While a black or navy knitted tie go well in winter, a green knitted tie will suit spring and light knitted ties work great in warmer months. A quality knitted tie always has a place in your wardrobe, or at least as a backup in your suitcase. Take a minute to think about the best colours that suit your wardrobe for different seasons and start your knitted tie shopping spree.